Team Building or team bonding in Atlanta can be fun and exciting if you choose the right team building activities. 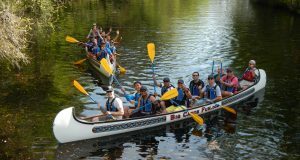 Adventures Up The Creek has the three most unique, outdoor, adventure-based, Eco-friendly team building activities in the Atlanta area — and they’re all guaranteed to be a big hit with any group. 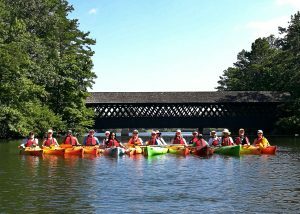 Just minutes from downtown Atlanta, Adventures Up The Creek offers Group Kayaking Outings, Big Canoe Adventures and Giant SUP Challenges at Stone Mountain Park on Stone Mountain Lake for groups of 6-to-22 paddlers — depending on the activity. Team Building activities can last anywhere from 2-hours to all-day events. The staff at Adventures Up The Creek has been developing custom team building programs for over 20-years and will work with meeting and event planners or activity planners to custom design a group event or activity that fits practically any agenda or itinerary. With any of our on-water group paddling activities, team building objectives are met organically and without effort in a natural environment — often exceeding expectations for improving communications, cooperation and team work within the group. Adventures Up The Creek / Big Canoe Fun operates the only giant War Canoes in Georgia. Our Big Canoes are 25-feet in length and can accommodate up to 10-paddlers each — making them perfect for both large group team bonding outings on scenic Stone Mountain Lake or races between two teams of up to 10-paddlers each. With or without a guide, every part of paddling a Big Canoe (also referred to as, “War Canoes,” or, “Voyageur Canoes”) requires communication, cooperation and team work. From boarding the canoes to paddling, maneuvering, racing and docking to unload, team work is not optional in a Big Canoe — it’s necessary and natural. 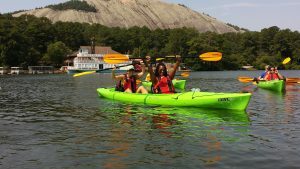 Large Group Kayaking adventures on Stone Mountain Lake take your group out of their daily routines and comfort zones and allow them to share an experience that is often a first-time proposition for many of the participants. The fun and laughter begin immediately and the entire experience is all-natural, organic and interactive — creating lasting memories and strong connections between participants. Using primarily tandem kayaks, teamwork is required on many levels with natural challenges built-in to the activity of tandem kayaking — and some not-so-natural challenges added for participants who think they’re up to the task. To book your Team Building Event or Activity in the Atlanta area, just email us at: info@UpTheCreekX.com or call and leave a detailed message at: 855-4-KAYAK FUN (855)452-9253. Stand Up Paddle boards (SUP’s) have become increasingly popular in past years but giant, MEGA SUP’s are relatively new to the paddling world. Our Mega SUP’s are over 18-feet in length and are rated for up to 8 adults (though we’ve seen as many as 13 on one during a team building event). With the Mega SUP’s, we aren’t limited to paddling at Stone Mountain Lake; we can bring these Giant SUP’s to practically any lake with water access. If you have an alternate location for your event, just give us the details and we’ll make sure it’s an appropriate site for the Mega SUP’s. 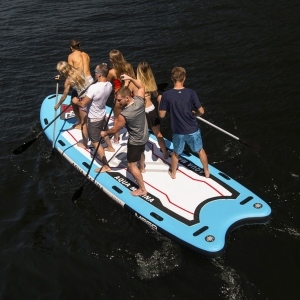 There are a number of team building games that can be played with Mega SUP’s and all of them involve the possibility of taking an unplanned swim. Because of that, we recommend Mega SUP’s only be used during the warmer half of the year to ensure comfort and safety. Stone Mountain Park is home to the Marriott Evergreen Conference Resort — which is conveniently located on Stone Mountain Lake next to the boat ramp where we launch our on-water adventures. Lunch arrangements can be made in advance for either a buffet in the resort’s restaurant or a catered event in the pavilion. As the name implies, there are also several conference rooms available for meetings and larger events within which team building or on-water wellness breaks are just available activities rather than being the entire focus of the event. The Marriott Evergreen Conference Resort also has ample lodging for out-of-town attendees or multi-day events. Contact their staff directly to arrange facilities and logistics for your next event in the Metro Atlanta area — but contact us directly (info@UpTheCreekX.com) for the lowest activity rates for your event. Most of the resorts we work with add a booking fee when you book activities through them rather than with the activity provider. Our group and team events are exclusive events with closed booking that is not open to the public. In addition to instruction and ongoing interpretation and oversight, our guides provide water and snacks; but attendees are welcome to bring along anything they’d like. To book your Team Building Event or Activity in the Atlanta area, just email us at: info@UpTheCreekX.com or call and leave a detailed message at: 855-4-KAYAK FUN (855)452-9253.